A Marketing Derby VIP Preview event was held this morning at Bondholder Derby College's Engine Shed restaurant. Hosted by Bondholder HUUB Design, where owner Dean Jackson and special guest Bailey Matthews announced the second Jenson Button Trust Triathlon to be held on 17th July 2016. Attended by over 100 guests, the event was full of stories and laughs, particularly from Bailey Matthews who won the Helen Rollason Award at the BBC Sports Personality of the Year Awards 2015. 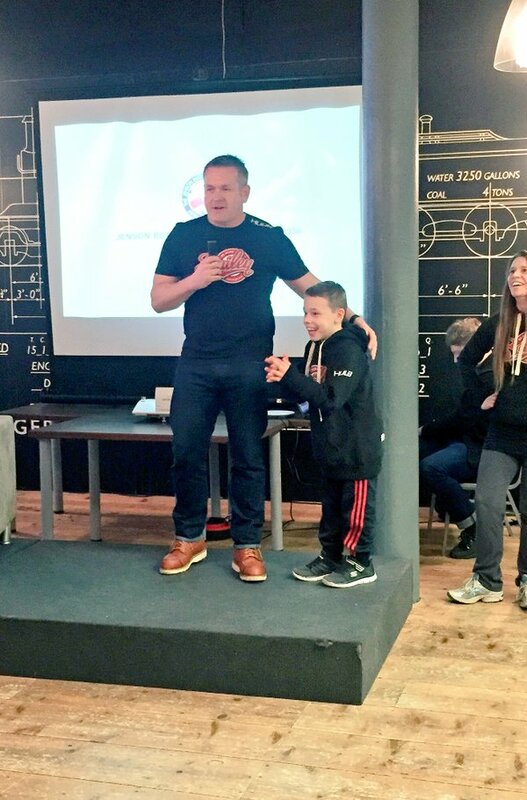 HUUB Design founder and owner, Dean Jackson, talked about the interest and success of last year's triathlon and plans for this year which include a new route through the city's Cathedral Quarter. Bailey himself then launched the Be More Bailey Triathlon designed for children who either have a disability or who just need a little bit of extra confidence. The event will have no timing, placing and is one where everyone gets a medal. Stealing the show with his fantastic stories and videos, Bailey shared his video message from Simon Cowell who said: "Bailey, you never call me anymore". Watch both Simon Cowell's good luck message and Bailey's story in the two videos below. The event was covered live ITV's Good Morning Britain show plus BBC TV East Midlands. The UK's biggest triathlon magazine has announced that after an initial round of voting the Jenson Button Trust Triathlon has been finalised out of all the UK 1,800 races in the top 5 for under 500 participants. Please show your support by clicking here and voting for HUUB in the category Race of the Year (<500 entries), Triathlon Wetsuit Brand of the Year and Tri-suit Brand of the year.